Keen Ice runs past American Pharoah to win the Travers. Donegal Racing's Keen Ice will commence his retirement and forego competing in the Breeders' Cup Classic. Ice, as the horse is affectionately known, wrenched his right ankle galloping this week. The injury was not severe, but it was enough for owners to withdraw him from the race, scheduled to be the last of his career. Keen Ice will retire to Calumet Farm in Lexington, Ky., where he will begin stallion duties in 2018. “Donegal Racing has been blessed to campaign a number of Grade 1 race winners,” said Jerry Crawford, president of Donegal. “But only Keen Ice has pulled off one of the biggest sports upsets of the century when he beat Triple Crown Winner American Pharoah in the 2015 Travers Stakes at Saratoga. 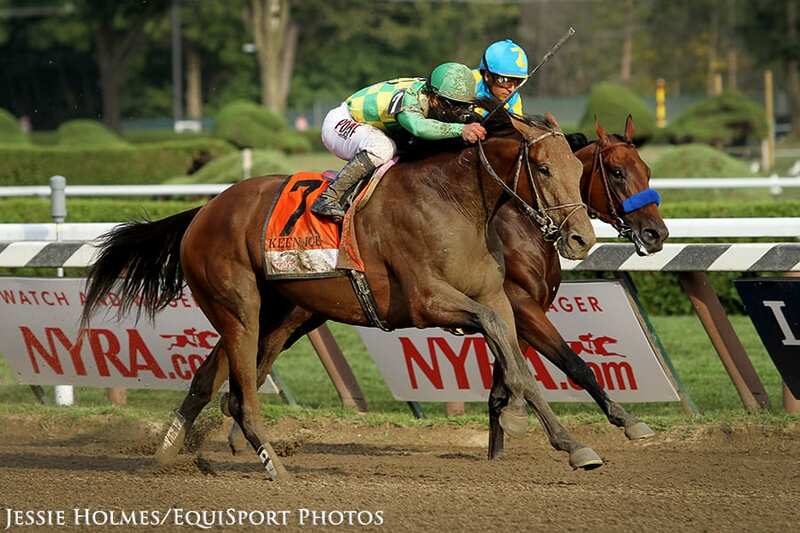 Ice racked up $141,968 per start over his 24-race career in route to lifetime earnings of $3,407,245. In addition to his Travers win, the horse's other G1 appearances yielded a third-place finish in the Belmont and second in the Haskell at 3, third in the Breeders' Cup Classic at 4, and – following a victory in the G2 Suburban – second in the Whitney and Jockey Club Gold Cup this year at 5. Crawford extended a special thanks to both Dale Romans who trained Ice early in his career and Todd Pletcher who trained Ice following his injury as a three-year-old. Crawford also thanked Glencrest Farm, the breeder of Keen Ice, and Barbara Banke for standing Curlin, Ice's sire. He was produced from the Awesome Again mare, Medomak. “And now it is time for Ice to go make babies,” Crawford said. He added that Donegal Racing will be first in line to buy them. This entry was posted in Breeders' Cup, NL Article and tagged Calumet Farm, Curlin, Dale Romans, Donegal Racing, glencrest farm, Jerry Crawford, keen ice, todd pletcher, travers by Edited Press Release. Bookmark the permalink.